Thanks to Doug and Mitch for putting on a terrific game at Historicon. The Battle of Rivoli in 15mm at 1"=75 yards using ESR Napoleonics. 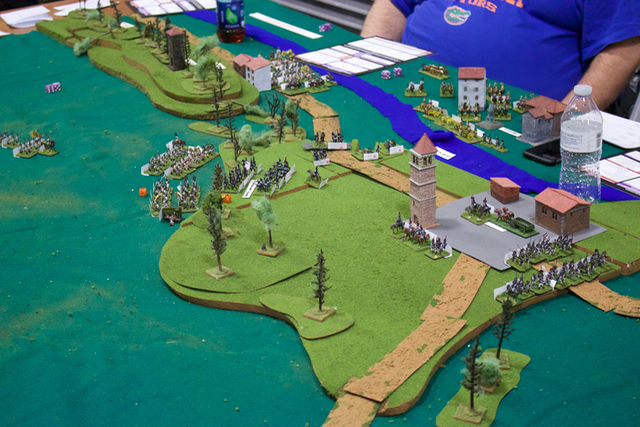 You can read a brief AAR of their game as well as see more photos in the TWC Gallery. Forgive me saying so but I am perplexed by the terrain. It doesn't look much like the Rivoli battlefield to me. Am I misunderstanding something? I agree with this, the layout is all wrong, even the river is in the wrong place?. Any idea what modifications they used? How they structured forces and formations for such small armies without a corps structure? I believe they structured the Austrian Army as an Army, with most of the columns being considered a Force of a single Formation. They ran the game for all new-to-ESR-players, so with this arrangement, most players only had to worry about giving orders to one Formation. They also made some change to the way fatigue was allocated but I am uncertain of the details. I realise this wasn't an 'official' TWC ESR game. I wasn't knocking ESR – I've only heard good things about it, and would be interested to try a game of it myself some time. And a convention game should first and foremost be a game, not an exercise in historical pedantry, so if all concerned had a good time, great, well done. I wouldn't normally have quibbled like this, except that I have been looking very closely at Rivoli recently and it is quite near to my heart. That Wikipedia map is not a great source. Understood, and no offense was taken. I was simply trying to say that while 'we' are posting about the game, I can't speak to many specifics because we weren't involved in running it. There are definitely better maps, just that I believe that was the map they used. And thanks for the kind words about ESR, hope you give it a try! "Speaking of maps, there is an excellent map available that someone on another message board pointed out to me" – yep, that was me too! Well, thank you, it is a good map! For connoisseurs of rough terrain, it's a field with few equals. "One occasional poster on this forum did a magnificent 10mm Rivoli board a few years bak"
The map TWC reposted above is better. The Rivoli position can be characterized roughly as two concentric semi-circles of hills – generally with gentle slopes facing the enemy, and steeper slopes on the inside towards Rivoli. The Wikipedia map seems to be derived primarily from a very simplified schematic one in, I think, Chandler. I think he typically uses the West Point atlas that was drawn up to accompany Yorck Von Wartenburg's "Napoleon as a General." Very similar to the later and better known "West Point Atlas of the Napoleonic Wars," as both maps were drawn by the USMA History Department's long-serving and very talented cartographer, Edward Krasnoborski. I have both versions; similar but not identical, but I think the older book might be better suited to terrain building, because the coloring of terrain features is notably darker. Some pictures if it helps. Essentially there is dead ground at x-x behind the hills of Trombalora (B---B---B). The heights or San Marco are at C-C. I think the game is not wrong, it just underestimates the mountainous nature of San Marco and dues not have the Trombalora hills correctly raised above the plateau and providing a strong defensive position. Just to clarify, I was referring to Xin's Rivoli build in the post above, not talking about the Historicon terrain. Those Austrian units that traversed the mountain were in wretched state for the battle. Pretty much worn out. Wonder if they took that into account? 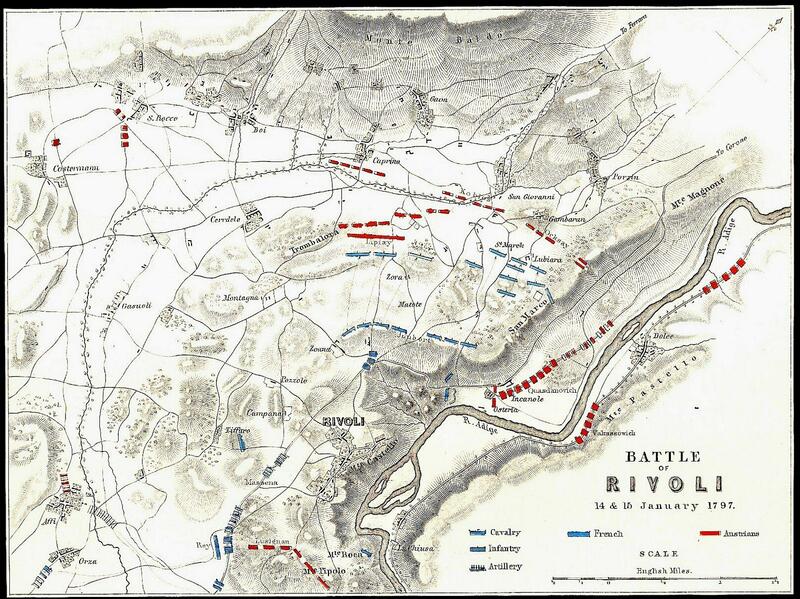 I would be interested in hearing how ESR did with the battle considering it involved a lot of maneuvering.